NAUMAN, Bruce. 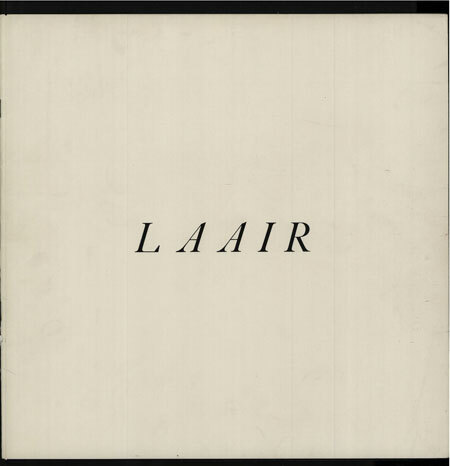 L.A. Air. [New York]: Multiples, 1970. Slim quarto, original wire-stitched coated white self-wrappers. First edition of this photographic satire of Los Angeles air quality, with ten full-page “images,” one of only 600 copies. Bruce Nauman’s tongue-in-cheek L.A. Air consists of ten “superbly colored skies (already polluted? )” (Les Musées d’art et d’histoire, Geneve). It is Nauman’s contribution to Multiples’ Artists and Photographs portfolio of 1970, limited to only 600 copies, with the artist’s signature printed on the rear wrapper.